This past year has seen a record number of extreme weather conditions and patterns all across the world. From the hurricanes that toppled entire countries back in the fall, to one of Mexico’s biggest earthquakes to record cold temperatures across the world this past December. Although these catastrophic weather issues have had a massive impact on the world at large, in many ways, British sport is also being affected by these ever-changing extreme weather patterns. One doesn’t often hear stories about the effects of climate change on more central areas like Britain, however, it seems that many golf courses are feeling the wrath of these global changes. According to reports, climate change is responsible for a twenty percent drop in golf playing time in Scotland due to Coastal erosion, cricket has seen a 27 percent drop in reduced games due to excessive rain, and the Scottish skiing industry is at risk from a lack of snow and ever-growing global temperature. 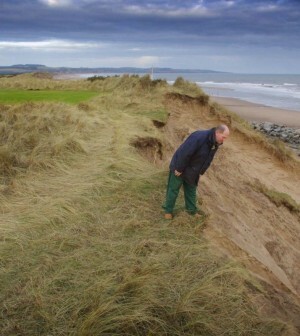 Reports are saying that eighty golf courses are at risk of coastal erosion, rain affecting cricket matches has doubled in the past six years, and it’s anticipated that only sixteen of the nineteen ski hills in Scotland will still be capable of hosting the sport in less than a hundred years. It seems somewhat ridiculous to think of climate change as something that is negatively impacting sports, especially when the larger world is at risk. However, all of these different sports across Britain are able to formulate data based on their business and are proving that something huge is happening. Unignorable as it is, it’s now up to these individual sports to assist in initiatives that will help keep their respective industries afloat.